Bifold closet door installation instructions are fairly easy to follow. This is good news for do-it-yourselfers who appreciate the bifold doors many benefits. Bifold doors can save space in a small room, provide increased visibility into a cramped closet and save time and money on materials and installation. Follow these bifold closet door installation instructions. 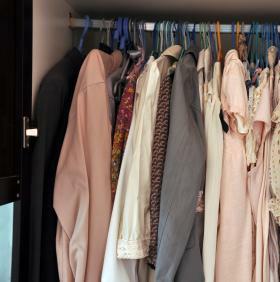 Remove the existing doors and then take very careful measurements of your closet opening. Take measurement of both the height and width. Remember the old adage, measure twice and cut once. Once you have accurate numbers, you can head out to the store to purchase your bifold doors. Based on your measurements by the number of bifold doors you need at the home improvement store. Be sure to select a door with a height approximately one half inch shorter than your closet opening and 1" less wide than the closet opening. You will need this extra space for hardware and so that the doors open and shut smoothly. If the doors are too big when you get them home, you can plane them to fit. Your next step is to install the track along the top of the closet opening. This will allow attach the door in place and allow it to glide open and shut easily. The track should be included in the package when you buy the doors. It can be attached with an electric screw gun. Center the rail in the middle of the closet. Also included in your door package will be floor brackets. They need to be attached to the door frame against one of the sidewalls. Then install dowels in the predrilled holes in the doors. Again, the dowels will come with the package. One dowel will come with a screw that allows you to adjust the door height. Once the parts are in place, you can install the bifold doors into the rail and bracket. For best results, pop the top of the door into the rail and then slide the bottom into the bracketrs. You can use the dowels like pivot points to adjust the exact positioning of the doors, including the height. Finally, install the door knobs by drilling holes in the center of the doors and screwing the knobs tightly in place. These instructions should only be used as guidelines. Follow the factory bifold closet door installation instructions that come with the bifold door package you purchase. Installing these doors is very simple but you might need an extra set of hands to help you maneuver the doors. Other than that, all you need is a screw gun, a yardstick, a pencil and screws. You may also need a planer if your doors fit too snug. Some additional steps you can take when installing closet doors is to stain or paint the doors to match your interior. It is best to paint the doors and let then dry completely before you install them. Once the doors are installed, you can also affix mirrors to them. Just be sure the mirrors are not too thick so as to interfere with the opening and closing of the doors. Finally, for a unique touch, you can replace the doorknobs that come with the doors with decorative door knobs to match your décor. A successful installation can make your room seem bigger, neater and more organized. Plus by installing doors yourself you can save time and money and feel proud of your home improvement accomplishment.